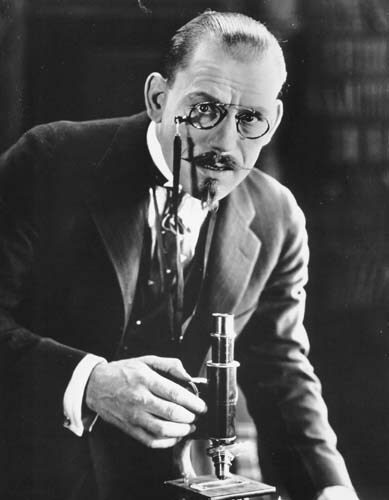 SYNOPSIS: Dr. Anthony Lamb has been experimenting with methods for prolonging human life. A half-man, half-ape, lumbers through his house, a victim of his early experiments. In another part of town, Robert Sandell, an unsuccessful writer, is distraught because his mother is ill, and must be seen by a specialist. Desperate for money, he attacks Dr. Lamb in the park, but is overcome, and the Dr. brings him to his home. Robert tells of how his family was once prosperous, and he was engaged to marry Angela Marshall. His father died, and they fell into poverty. Robert went to war, and when he returned he found his mother seriously ill. Dr. Lamb drugs Robert, and over the protests of his wife, plans to perform experiments on him. Robert awakens the next morning to find his mother has been brought to Dr. Lamb's home. The Dr. says that she is dying, but that he can save her...if Robert will agree to let him conduct a surgical experiment on him. Robert consents, and Dr. Lamb performs delicate surgery that saves the woman's life. Knowing that his mother is out of danger, Robert goes off to spend a few days with Angela. Mrs. Lamb and the ape-man are both terrified of Dr. Lamb, and the two plot to prevent the evil experiments planned for Robert. At a charity ball, Robert and Angela plan their engagement, but Dr. Lamb arrives and tells Robert that he must return to the laboratory now. Mrs. Lamb warns Robert of the danger that lies ahead, and tells him that he may end up like the ape-man. That night, the ape-man brings Robert a note from Mrs. Lamb, and he follows the strange creature through a passage that leads to a laboratory. There, Robert finds cages full of snarling half-men, half-apes, all failures from previous experiments. Dr. Lamb arrives and explains his experiments to Robert. Robert and the Dr. fight, but Robert is overpowered and strapped to the operating table. The ape-man enters, and refuses to obey the order to leave. The ape-man throws the lever that releases a huge beast- man from a cage. Dr. Lamb fires his revolver at the creature, but the beast grabs the doctor and breaks his back before dying of the bullet wounds. Robert marries Angela, and finally finds success as a writer, selling the story of his strange experience. 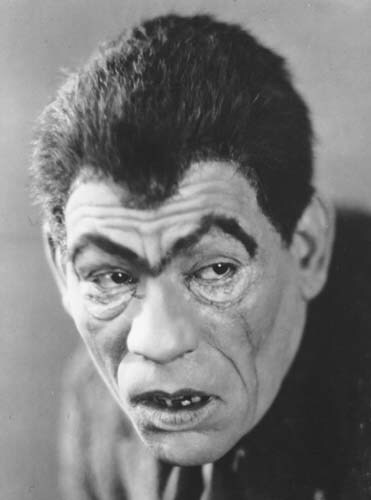 NOTES: Much of Chaney's current popularity rests on his laurels as a "horror" film star, yet only a very small handfall of his films were genuine horror films. 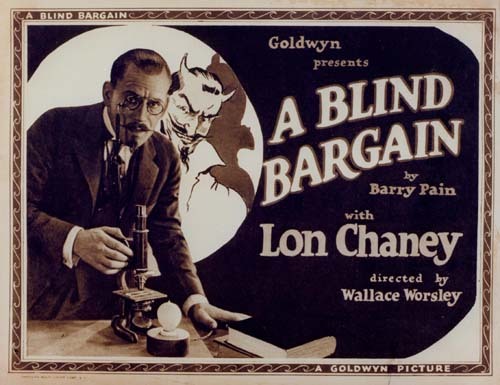 A BLIND BARGAIN is one of the true horror roles, two roles rather, in Chaney's career. As both the mad scientist and the ape man, he had an opportunity to sink his teeth into two meaty roles, both with makeup. No prints of A BLIND BARGAIN are known to exist today, and it remains one of the most important lost films of Chaney's career. Readers interested in learning more about A BLIND BARGAIN are encouraged to read A Blind Bargain by Philip J. Riley, available from MagicImage Books, a complete reconstruction of the film including detailed production notes and a reproduction of the original screenplay. Also, check out this lobby card in my Poster Gallery.